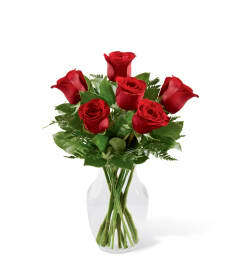 The FTD® Lasting Romance® Bouquet blossoms with roses and lilies to display your love and affection in classic Valentine's Day grandeur. 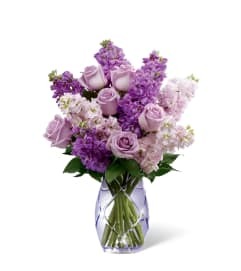 Rich red roses, eye-catching Stargazer lilies, and pink Oriental lilies are accented with fragrant white stock and lush greens to form an impressive flower arrangement. 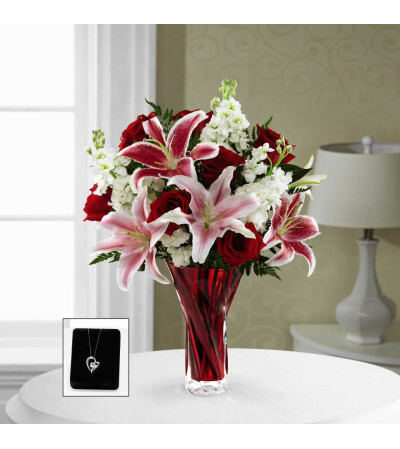 Presented in a designer red glass vase and accompanied by a stunning sterling silver heart-shaped pendant with a genuine white topaz accent, this mixed flower bouquet is set to express your heart's every emotion with its endless beauty and elegance just in time to celebrate this coming February 14th.